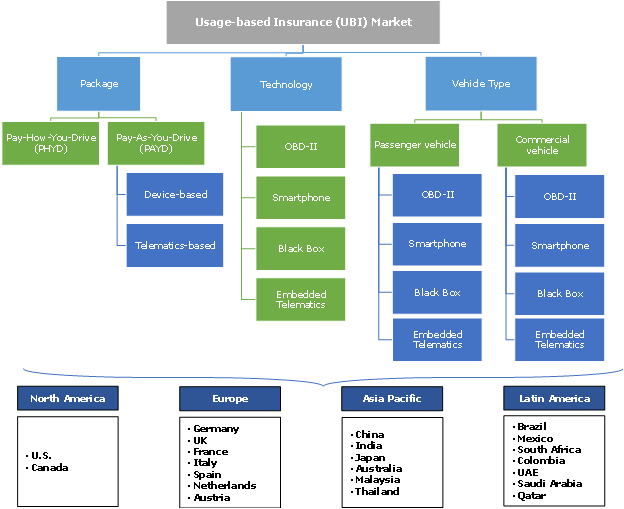 Usage-based Insurance Market size estimated at over USD 34 billion in 2017 and will grow at a CAGR of 17% from 2018 to 2024. The usage-based insurance market growth is driven by rapidly growing usage of insurance models such as PAYD and PHYD. With UBI, the insurance companies determine the premium based on drivers’ driving behavior. The adoption of telematics and other communication technologies to monitor the driving patterns will lead towards excellent market growth over the forecast timeline. 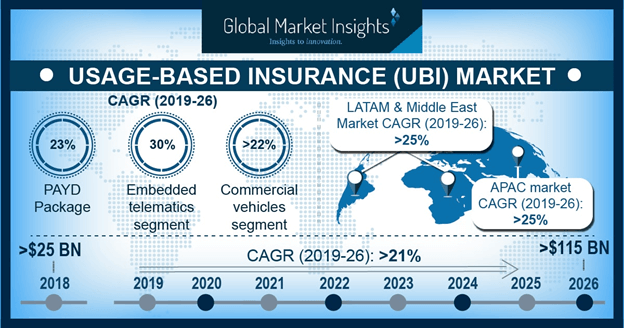 The market growth is attributed to the factors such as growing popularity of the Manage-How-You-Drive solutions, increased penetration of smartphones, and rise in the usage of UBI by insurance companies to increase profitability. usage-based insurance makes it possible for the insurers to evaluate risks based on each driver’s profile, trip characteristics, and the current condition of the vehicle. This helps them in a better assessment of the risks and the prevention of fraudulent claims. The insurers are using insurance telematics to increase their customer base by using driving data to improve the policy pricing. The adoption of smartphones with telematics applications enables car makers and insurers to collect driving data and record trip parameters of hard braking, and acceleration. The driving data then is used by them to design usage-based insurance policies and in determining the policyholder’s premium. The huge adoption of smart-phone-based telematics is expected to drive the usage-based insurance market growth. 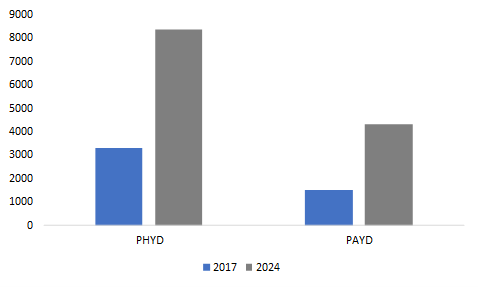 The PAYD market is expected to register an excellent CAGR of over 19% during the forecast timeline. PAYD insurance focuses on monitoring miles driven and pricing policies based on the mileage. With PAYD, insurers provide customers an option to select the number of miles they want to have and enable them to buy additional miles in case they need them. PAYD promotes safe driving as the customers will be charged more if they do not drive well. In 2017, device-based PAYD solutions held a dominant share of over 80% in the usage-based insurance market. Various devices, such as odometers, OBD dongles, and smartphones, are used to gather the driving information to determine the driving behavior, fuel efficiency, and road conditions. These devices hold the largest share of the insurance telematics market as they are easy to install and also provide a wide range of connected car services ranging from diagnostics, remote car control, maintenance alerts, and location tracking. The embedded telematics segment is projected to grow at an impressive CAGR of over 26% in the overall market between 2018 and 2024. The telematics technology enables car owners and insurers to aggregate a massive amount of data on car usage patterns, maintenance needs, and performance. The automakers are installing telematics equipment in vehicles, which measures actual driving habits based on a vehicle’s real-time driving data. Based on this data, the insurers can decide the premium amount offered to the driver. The smartphones are widely being used in telematics as standalone devices or with embedded technology. The telematics applications in smartphones provide users with an instant feedback based on their driving style and provide tips to improve their behavior to avail higher discounts on the insurance premium. The passenger vehicles segment held a major share of the usage-based insurance market of around 85% in 2017. The use of telematics devices in passenger cars enables drivers to monitor the vehicle parameters and helps in improving the four types of service areas such as information, safety, navigation, and remote diagnostics. 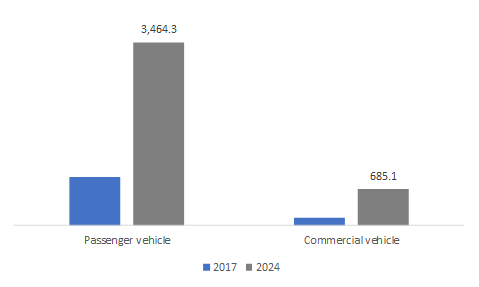 The growth in the number of passenger cars will augment the adoption of telematics solutions, which will provide the relevant information to the insurers about the driving patterns and help in customizing insurance policies based on the driving behavior. In LAMEA, the usage-based insurance market is projected to witness the highest growth rate of over 25% from 2018 to 2024. The market growth is driven by an increase in the uptake of telematics technology to support the insurance telematics programs in the countries including South Africa, Brazil, and Mexico. The software solution providers are partnering with insurance companies to offer new insurance telematics solutions. The competition in the insurance telematics market is characterized by various partnerships and acquisitions happening between insurance providers, automakers, and telematics solution providers. Some of the major players of the operating in the market are Progressive, Allstate, State Farm, AXA, Allianz, Liberty Mutual, Nationwide, Vodafone Automotive, UnipolSai, Generali, Octo, Metromile, TomTom, Insure The Box, Mapfre S.A, Zubie, Desjardins Group, Sierra Wireless, IMS, Cambridge Mobile Telematics, and Danlaw. The telematics technology has transformed the automotive insurance industry. Earlier, the automotive insurance policies were based on factors such as demographics and personal information. With the advent of telematics, the insurers consider several factors such as hard braking, acceleration, location, and the type of the road used to analyze the driving information. Telematics data enables them to assess the driver profile risks and develop new customized UBI policies based on their driving habits. The rise in the number of connected cars has also contributed toward the growth of the usage-based insurance as they collect a massive amount of data, which then can be used by car makers and insurers to determine the driving behavior and vehicle conditions.